Attention Sophomores: If you are interested in attending the HOBY Seminar, please turn in your essay to Mrs. Nafziger or Mrs. Frazer by Friday, Oct. 26. High School quiz team members: There will be practice today from 3:30-4:30 in Mr. Switzer’s room. Senior quiz members: Please come to Ms. Dorosz’s room at lunch today. College Reps this week: Today – Indiana Wesleyan at 1:55 (during Activity Period) and Hesston College at 11:25. Afternoon Activity Period today will be for Spanish Club. They will meet in Sra. Richer’s room. Was it Miss Scarlet, in the kitchen, with the wrench? Or was it Professor Plum, in the study, with the lead pipe? The answer will be in the theater this weekend at the high school production of “Clue” – performances are Saturday, 10/20 at 7:00pm and Sunday, 10/21 at 3:00pm. Don’t miss it! Good luck the to the varsity volleyball team as they take on Edgerton tonight in the sectional final at Holgate High School starting at 5:30pm. Ticket prices are $6 for adults and $4 for students at Holgate High School. Also, the theme for the game tonight is “USA!” Good luck! There will be a junior high boys’ basketball meeting on Monday, October 22 during lunch in room 150. Bring your lunch to the meeting. Any questions please see Mr. Leppelmeier. Next week is “Good Vibes Week.” Here are the daily themes: Monday – Peace: Wear tie dye. Tuesday – Love: Wear red. Wednesday – Respect Yourself: Wear something you feel confident in. Thursday – Kindness to Others: Wear a different high school or college shirt. 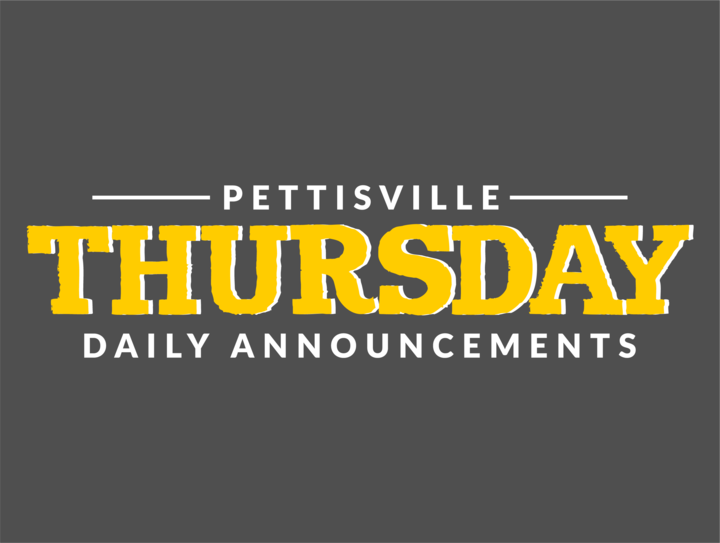 Friday – Togetherness: Wear a Pettisville shirt. Wednesday, Oct. 17 - Attention Juniors: Many class supper work forms still need to be turned in. Also, only about half of the amount needed in money donations to cover the cost of baked goods has been turned in. Please make sure forms and donations for the class supper are turned in by tomorrow to Mrs. Wyman. High School quiz team members: There will be practice this Thursday from 3:30-4:30 in Mr. Switzer’s room. Senior quiz members: Please come to Ms. Dorosz’s room at lunch on Thursday. College Reps this week: Today – Eastern Mennonite University at 11:15. Thursday, Oct. 18 – Indiana Wesleyan at 1:55 (during Activity Period) and Hesston College at 11:25. High school soccer players need to turn in soccer jerseys to Coach Switzer by tomorrow. Attention Juniors: Money donations to purchase pies for the junior class supper must be turned in tomorrow. Donations are to be turned into Mrs. Wyman. The donations are important so class funds do not have to be used to purchase pies for the class supper. Also, work schedule forms were to be turned in by last Friday. They are now late. Please take responsibility and get both of these taken care of. Thank you to those who have been prompt in getting forms and money turned in. The first session of the Science of Historical Cooking STEM module begins today after school. Please meet in the atrium at 3:15pm to travel to Sauder Village. We will return to school by 5:15pm. College Reps this week: Wednesday, Oct. 17 – Eastern Mennonite University at 11:15. Thursday, Oct. 18 – Indiana Wesleyan at 1:55 (during Activity Period) and Hesston College at 11:25. Warning!! Operation Christmas Child is underway! Local FCA’s are having a competition to collect the most packed shoeboxes for Operation Christmas Child. The winning FCA will have a pizza party, so we all need to pitch in and help. There will be a table set up in the atrium today at lunch where you can get more information or donate a packed shoebox. Thank you for your participation! Attention girls in grades 9-12 playing basketball this year. Please see Coach Waldvogel today to give him your travel suit size. The varsity soccer team lost a close overtime match with MVCD last night in the sectional finals by a score of 2 to 1. The Blackbirds finish the season with a winning record of 8 wins, 5 losses, and 3 ties. Congratulations on a fine season and thank you to the seniors for their time and dedication to the program. There will be junior high boys’ basketball open gym tonight at 7:30pm in the junior high gym. There will be high school boys’ basketball open gym tonight in the varsity gym at 8:00pm. Pettisville’s Urban Soils team traveled to Licking County Saturday and placed 26th of a possible 50 teams. The team was Clara Damman, Baden Skates, and Carson Bennett. They had the best score of any of the teams from District 1. Attention Juniors: Money donations to purchase pies for the junior class supper must be turned in by this Wednesday. Donations are to be turned into Mrs. Wyman. The donations are important so class funds do not have to be used to purchase pies for the class supper. Also, work schedule forms were to be turned in by last Friday. They are now late. Please take responsibility and get both of these taken care of. Thank you to those who have been prompt in getting forms and money turned in. The first session of the Science of Historical Cooking STEM module begins tomorrow after school. Please meet in the atrium at 3:15pm to travel to Sauder Village. We will return to school by 5:15pm. Congratulations to the varsity girls’ cross country team for their BBC Championship on Saturday. This is the 6th championship a row for the girls. Congratulations to Kate Stuber for earning the BBC Runner of the Year finishing in first. Morgan Leppelmeier finished 4th, Sarah in 5th, and Kelly Miller in 7th – all earning first team BBC honors. Congratulations to Logan Rufenacht for earning the BBC Runner of Year finishing in first. Calvin Nofziger earned 2nd team BBC finishing in 9th. The varsity boys placed 3rd overall. The junior high boys finished in 2nd place led by Zach McWatters in 4th place, Braxton Huner in 8th, and Oliver Shaw in 10th. The junior high girls finished in 3rd place led by Elise Hoylman in 7th and Sophie Sterken in 9th place. The 8th grade volleyball team was victorious over Montpelier in the BBC tournament quarter-finals. They were defeated by Hilltop in a close three set match in the semi-finals. The 7th grade team was defeated by Montpelier in the BBC quarter-finals. Congratulations to Max Leppelmeier for his finish at the OHSAA State Golf Championships at NorthStar Golf Club over the weekend. Max finished tied for 20th place out of 72 total golfers. Detention today will be in Mr. Kester’s music room.